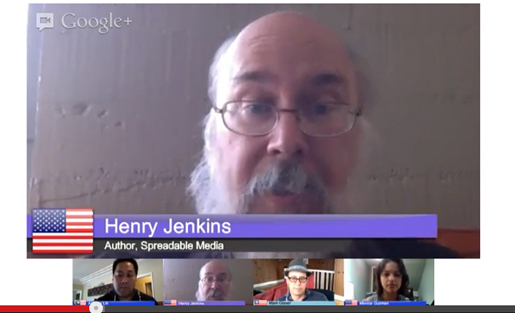 Henry Jenkins co-authored the book "Spreadable Media," and discusses his further ideas on participatory culture and how fans help spread media. Have we reached the point of a Big Brother state online? It sure seems that way with the recent revelation that the FBI and Department of Justice routinely read private emails, Facebook messages and Twitter direct messages without a warrant — flouting the Fourth Amendment. We’ll discuss that and more on this week’s episode of the Mediatwits, with special guest Henry Jenkins, professor at USC and co-author of “Spreadable Media,” looking at how media spreads and why. We’ll ask him why he hates the term “viral” media, and talk about his favorite fan-created media. There’s also been a brouhaha about “open interviews,” with Gittip founder Chad Whitacre saying he will only do interviews streamed publicly online — which led to TechCrunch refusing to participate. Should journalists do interviews in public? Our roundtable includes host Mark Glaser, Seattle Times’ Monica Guzman and USC’s Andrew Lih. Henry Jenkins is Provost’s professor of Communication, Journalism, and Cinematic Arts at USC. He is author of “Spreadable Media” (2013), “Convergence Culture” (2006), “Fans, Bloggers, and Gamers” (2006), “The Wow Climax” (2006), “Textual Poachers” (1992), and “What Made Pistachio Nuts?” (1992), and is co-author or editor of seven other books on media and communication. 1. U.S. government can look at your emails without warrant? The ACLU got access to government manuals that show that the U.S. Deptartment of Justice and FBI believe they don’t need a search warrant to review Americans’ emails, Facebook chats, Twitter DMs and other private files. The IRS recently ended its practice of looking at private emails without warrants. When senators found out the IRS was doing that, they rebuked the agency, and the IRS changed its policy on emails — but not FB messages and other private data. What should the balance be for the FBI and DOJ for warrantless searches when it comes to terror or other sensitive cases? Has the U.S. government gone too far toward Big Brother when it comes to our online communications? They are asking for back-door access to ISPs and companies so they can more easily see private communications. These can easily be fishing expeditions without having any kind of warrant signed by a judge. Our special guest is Henry Jenkins, a professor at USC and previously director of the MIT Comparative Media Studies Program, and one-time guest blogger on MediaShift. He co-wrote the book, “Spreadable Media” with Sam Ford and Joshua Green, looking at participatory culture and how media spreads online. They don’t like the term “viral” because it assumes media spreads without the users’ input. They mention many examples of spreadable media such as Susan Boyle’s singing on YouTube and and the Old Spice “Smell Like a Man, Man” campaign, which not only spread but also included audience interaction. Henry, you coined the term participatory media in 1992. How has it changed since then? What recent examples of spreadable media have taught you more about it? Should publishers and journalists think beyond page views when it comes to spreading media? And also: Explain how you did your enhanced book and continued the conversation online. Chat Whitacre, founder of Gittip, a gifting exchange, said he would only do an interview with tech blog TechCrunch if it was “open,” streamed publicly on a Google Hangout just like on our podcast. The journalist refused, and there has been much discussion on why journalists should or should not consent to “open” interviews. When Mathew Ingram at PaidContent asked journalists what they thought of this, many said they were fine with it, while others said it made them uncomfortable or that the audience wouldn’t want to see the raw footage. Should journalists start to get used to this level of transparency, except for very sensitive interviews? How far will this kind of transparency go? Can it help unmask any too-close relationships between journalists and sources? Do we have a right to privacy online?